Puzzle blocks cursor indicates you need to use an inventory item. Hand cursor allows you to interact with the environment. Magnifying glass cursor zooms into the specific area. Dialog popup indicates that you can talk to someone. Curl cursor allows you to ratate the object. 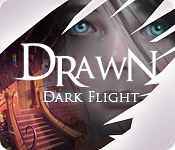 Sign-up to get informed when the Drawn series has new game released with BD Studio Games' FREE bi-weekly newsletter.